Our latest Above Ground Pool is a unique concept based on years of experience by the manufacturer in the timber industry. 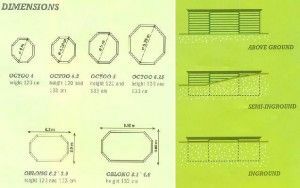 The concept brings beauty and functionality together in a quality swimming pool, the top of the bill being the unique patented system of dovetail joints. The joints are reinforced by a stainless steel threaded bar, which allows you to tighten the frame at any time and also makes it easy to take apart. 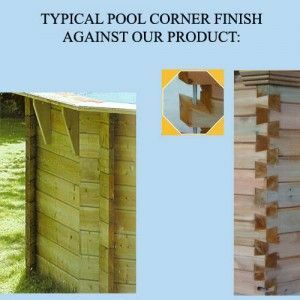 Unlike other manufacturers that make pools with protruding joints, this pool has none thus making it totally safe and child friendly whilst keeping the pools aesthetic looks optimum. 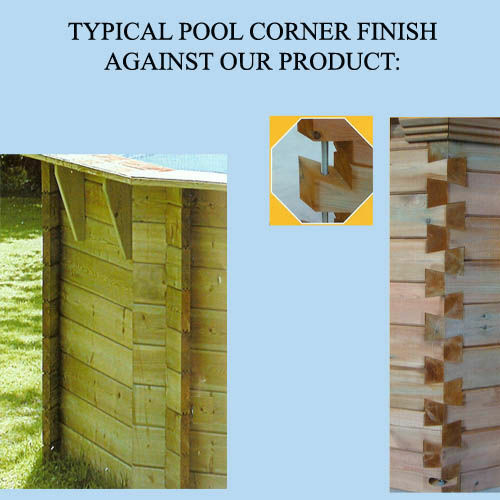 The image below shows a traditional finish on the corner of the pool next to our products finish on the right. 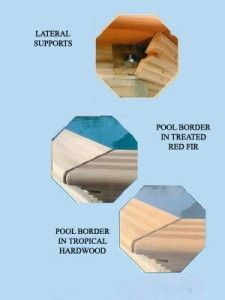 Our pool product also has extra thick pool borders that clip on top of the basic pool structure. They are made in one piece to avoid any distortion, and are held in place by lateral supports, which hide the fasteners and create a visually pleasing finish. 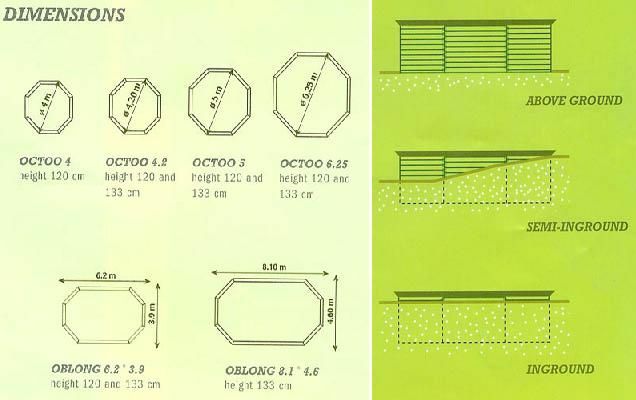 The borders are reinforced so you can easily stand or sit on the side of the pool. Borders come in pinewood as standard. For an extra price you can have a choice of treated red fir and tropical hardwood. 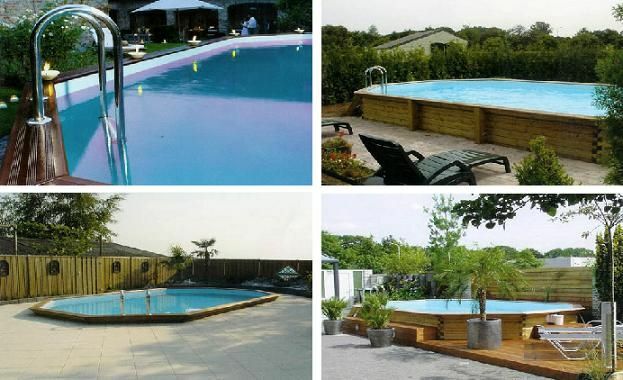 You also have the option to leave your pool completely free standing, or you can make the pool semi in-ground. 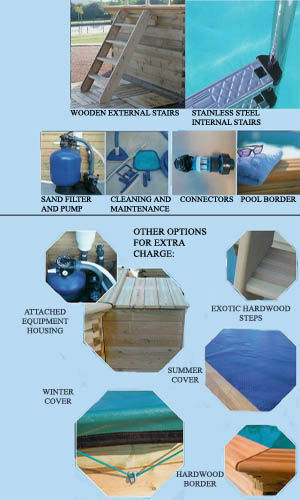 Alternatively you can completely submerge the pool in-ground or just deck around it. There are lots of different ways to set your pool up in your garden making this product versatile enough to cater for everyone’s ideas. 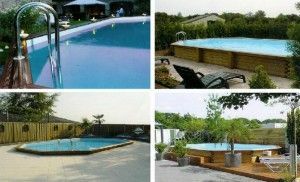 – we will not be beaten on our prices for these above ground pools (UK prices). Please contact us for further information.